From January until March the Vienna Rathausplatz will be transformed into a huge ice rink and becomes a paradise for ice skaters of every age. The "Little Ice World" opened on 17 November as part of the Vienna Christmas Dream. The idyllically illuminated façade of City Hall forms the fairytale backdrop for Vienna Ice World. An 8,000 m² ice landscape delivers entertaining winter enjoyment for skating fans of every age. Both families and sporty visitors who are seeking action on the ice will get their money's worth here. Every day from 10.00 am to 10.00 pm, fantastically wild or sweepingly elegant loops can be turned to popular music hits and to some sounds of the waltz. From 17 November until 14 January, a smaller rink of 3,000 m² will be open at the Vienna Christmas Dream during the Vienna Ice World. 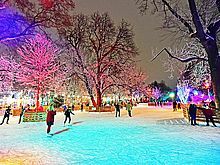 Winding through the romantically illuminated City Hall Park is a magical ice path that thrills beginners and professionals alike with its countless routes. A free practice area is available for the very youngest ice skaters from Monday to Friday, from 10.00 am to 4.00 pm. At 5.00 pm, it transforms into eight curling lanes, where sporty curlers can put their skills to the test. Restaurateurs pamper guests with delicacies made from regional and organic ingredients at various outdoor booths and in the popular Almhütte with terrace. Warming drinks are also available at Vienna Ice World - from fragrant organic punch to tea. There are 2,000 pairs of ice skates (all pre-heated with warm air) for rent on site. Lockers are available for any items of clothing or shoes that you don’t need while skating.